A prison officer has suffered a neck wound after she was attacked at a jail in County Antrim. 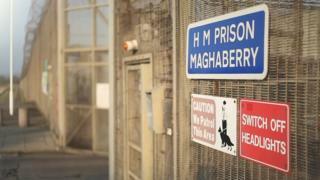 The woman was taken to hospital after the incident involving a male inmate at Maghaberry Prison, near Lisburn, on Monday. She has now been discharged from the Ulster Hospital. Adrian Smith from the Prison Officers Association (POA) told BBC News NI the woman was one of the newer prison officers. He said he believed she was attacked with a weapon "made from a razor". "She has an approximately three inch deep cut below her left ear," he said. "With the ever increasing budget cuts, I believe this will happen more often," he added. A Prison Service spokesperson said: "The Prison Service utterly condemns this attack and has referred the incident to the PSNI".